Tencent has become the first Chinese company to be valued at more than $500 billion. Shares of the 19-year-old company, which is listed on the Hong Kong Stock Exchange, rallied to reach HK$418.80 to give it a market cap of HK$3.99 trillion which takes past the $500 billion mark. Close rival Alibaba is Asia’s second-highest-valued firm at $474 billion. As SCMP pointed out, a US$9,000 investment in the company’s 2004 IPO would now be worth US$1 million. Just looking at the last twelve months alone, Tencent’s share price has doubled thanks to impressive earnings reports like Q3. 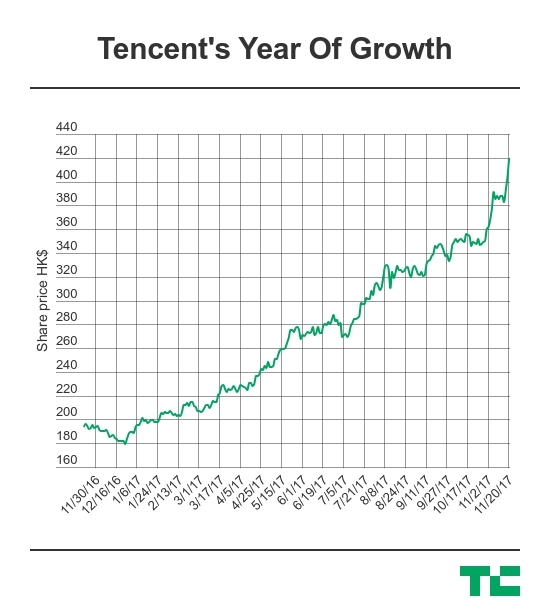 Tencent’s market cap has more than tripled since March 2014 when it reached $150 billion, surpassing Intel in the process. Writing then, The Wall Street Journal opined that the company “isn’t yet a household name in the U.S., but it should be” and that still applies today. WeChat, its messaging app that is China’s top social service, is closing in on one billion users overall but it has not managed to replicate that success overseas. Tencent has instead focused on investing itself into global positions. Its lucrative gaming business focuses on PC and mobile and is the heartbeat of revenue, accounting for $5 billion in the last quarter alone, thanks to smash hits like Honour Of Kings, 2017’s top grossing game, and the acquisition of the companies behind hit games Clash Of Clans (Supercell) and League Of Legends (Riot Games). Tencent’s investment focus seems to have gone into overdrive over the last year. It has bought up stakes in public companies Tesla, Snap, invested in India-based unicorns Flipkart, messaging app Hike, health portal Practo and Uber rival Ola. Other earlier-stage deals include flying cars, lunar drones and asteroid mining, while longer-standing investments like Sogou (search) and China Literature (e-publishing) have gone public over the past month. If the recent Snap and Tesla deals are anything to go by, Tencent is likely to commit considerable resources to developing a base among U.S. tech companies. Not only does it believe it can learn from their experiences to boost its business in China, but it can add fresh perspective too — particularly around messaging/WeChat.